Oh WordPress, let me count the ways that you have annoyed me today. Losing my entire post after I clicked the Save button is at the top of the list. So here I am, typing it again. If you lose it again, I may be forced to reconsider our relationship. And speaking of relationships, I have long had a tumultuous one with pork. It just seems to be such a moody meat which can go from dangerously undercooked to dry and tasteless within the blink of an eye. And then of course, everyone’s idea of perfectly cooked pork is different. Mine falls much closer to dangerously undercooked than dry and tasteless. I like my meat to retain a slight rosy hue. But more often than not, I miss the window and my pork comes out inedible. Blah. 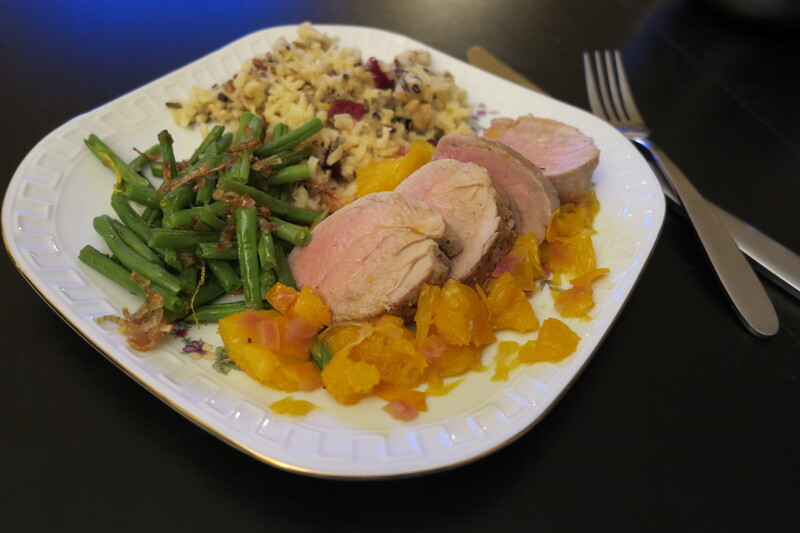 All of which is to say that I approached this week’s French Fridays with Dorie recipe, Fresh Orange Pork Tenderloin, with a certain amount of trepidation. I’ve been disappointing too many times. Why should I believe that this time would be different? Okay, okay, that’s probably a bit overly dramatic for a piece of meat. (But seriously!) I’ll settle down now and admit that Dorie’s recipe managed to impress me. I glared at that piece of pork the entire time it was cooking, but I followed Dorie’s instructions to the second, and it came out perfect. Slightly pink in the center, juicy, tender, perfect! I was so happy with how the pork turned out and will absolutely use Dorie’s method for cooking it again. The fresh orange sauce, not so much. It wasn’t really bad, but maybe a bit too sweet for my tastes. It left me wondering what Betsy came up with to placate Howard this week. I’m guessing that I would have liked his version better. This entry was posted in french fridays with dorie and tagged Around my French Table, main course, pork, seasonal - winter. Bookmark the permalink. Your meat looks to be just the right color – a refreshing plate of food. the whole tenderloin is so much easier. Have a great weekend. It looks wonderful, Rosa! Many of us concur that the sauce needs some more punch of some sort … Have a wonderful weekend. Yes, the pork was perfectly tender…our usual method is to marinate and grill. It was a nice change of pace, but not my favorite recipe, either. I’m not an experienced cooker of pork tenderloin, so it was nice to have this guide as an intro to it. I think I got it a teensy bit overdone for me, but the husband loved it and wanted more, so I guess it is a personal preference! Yours looks terrific, with just the right amount of color. Nicely done! I agree, the meat was great, the sauce was ok, but not so great. But on photo the sauce does very well. Rose, what lovely pork tenderloin slices with perfect pinkish centers! Your dinner looks wonderful – delicious green beans and rice seem like great side dishes. Looks perfectly cooked to be – I definitely err on the side of rare when it comes to meat. Once my mother in law said “We watch those cooking shows and they always leave the tuna so pink in the middle, it’s disgusting.” I knew for a complete certainty that we would never see eye to eye on most things after she said that. And it’s true. Your presentation is beautiful! Your dish looks great, and perfectly cooked. I’m with you, some other “something” would have been better (at least for me) than the sauce here. Oh, and I hear you – I think half of the difficulty with blogging is the site, and losing things! Hope you enjoy your weekend!! Rosa, you are making me laugh. I just read the last paragraph of your post aloud to Howard. There was no way to really adapt this to be half-fruited. I went ahead and cooked the pork in orange sauce and then served Howard just the meat. It was perfectly tender, though he found it a little plain. I wasn’t wild about the sauce. I will definitely cook pork this way again, but change up the sauce completely. Hope you are having a great weekend. your pork did turn out absolutely amazing!! I swear that youi are the only one of us who turned out “pink” pork medallions. That’s exactly how I love my pork and, unfortunately, I overcooked them and they were tough. Not Dorie’s fault. I think this recipe needed a little tweaking but didn’t mind the citrus/pork combo. Your plate looks delicious so thank you for posting twice and sharing it with us. That’s annoying, isn’t it. The dangers of undercooked pork are greatly overstated. Unless of course you are ‘growing your own’. But commercially supplied tenderloin is not as dangerous as we were brought up to think. Just sayin’. That said, for me, this was much better as a salad the next day. I’d almost make it again just to have as salad food for lunches during the week. Not really a reason to make something though. I feel for you in dealing with the WordPress issues. Losing a post can be incredibly frustrating so I am giving you bonus points for coming back to try it again (like the pork 🙂 I once lost an email to a family member and it had been one of those times when I was really on a roll……cracking myself up and in rare form….and particularly verbose as it was a catch up letter. All of a sudden it was gone and I think I was in denial for about 15 minutes and then furious. I told them I couldn’t re-do it and sent a “quickie” instead- they were howling with me, not at me… I think. Anyhow, your meal looks just lovely – even if the exact recipe is not going to be repeated again. It is always fun to try something new and using citrus for us during the cold, dreary winter days is a welcome adventure. I’ve not yet lost a post in WordPress, thank goodness, but it’s so discouraging to lose your work. Your pork medallions look perfect. Mine were a little more well done, unfortunately.